The *last* Spin-Dizzy Traveller of the year! You can use the New Products... page to see what the most recent additions to the store are. I'm looking for a way to also list "recently restocked" items on the New Products page for you too. There are fun gizmos I plan to add behind the scenes to enrich your shopping experience, so be sure to keep your eyes open for new shopping features. 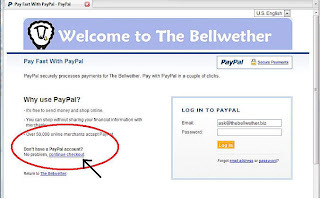 Did you know, you, the shopper, can use Paypal for your credit card payment at The Bellwether, even without a Paypal account? Yep! 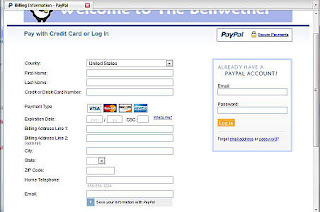 Simply choose the Paypal payment option, and when the paypal page comes up as shown on the left (click on it to see it in readable size), click on the link shown, "continue checkout". This brings up a new window, shown below the first one, that lets you pay with Visa, MasterCard, Discover, or American Express! Yay! Without having a Paypal account. There is one thing -- if you already have the card registered with a Paypal account, their system will require you to sign in to Yahoo to use that card. But if you don't want a Paypal account, this is a way to use your credit card without it! # How do you wind on a nostepinne? # How do I stop the fiber from matting in my hand? # How do I pick a drive ratio to spin a specific yarn? # What advice do you have for spinning mohair? # What is a bead spindle? Your questions are always welcome -- keep 'em coming! Thanks for shopping at The Bellwether!